An American Treasure, Now Within Your Reach! The story behind the1877 $50 Half Union, one of the most legendary pattern coins in American history, is full of famous names, last-minute saves and secret trades. Proposed as part of a quick solution for paper money-short but gold-rich bankers in California, the $50 Gold Half Union was meant to serve as a more convenient way to transfer funds. As the legislation started with promise, William Barber created designs that were later struck as patterns. When the bill died in Congress, the patterns were destined for the melting pot. Through the quick thinking of U.S. Mint Chief Coiner and Superintendent Col. Archibald Snowden, an equal exchange of bullion was made behind closed doors and the patterns were saved. Thought to be lost forever, the pattern coins eventually made their way to collector William H. Woodin. Once discovered, the U.S. Mint orchestrated a massive trade with Woodin to get the patterns back. Today, this beloved pattern coin safely resides within the walls of the Smithsonian Institution's National Numismatic Collection. 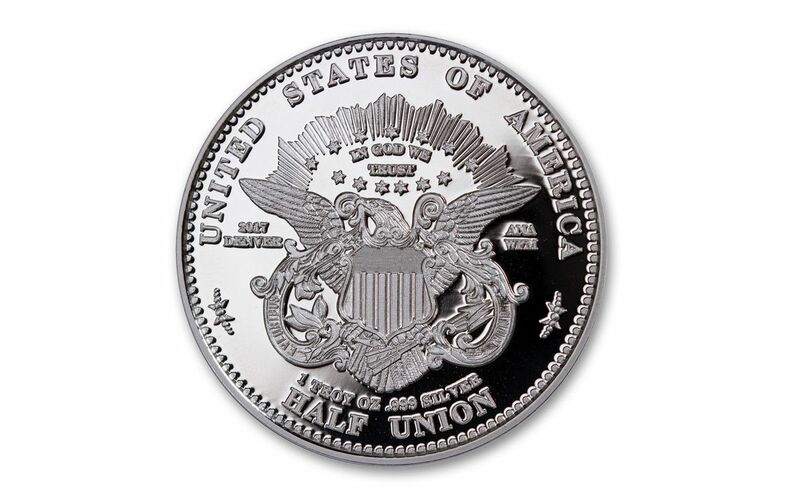 And now, to celebrate the 140th anniversary of this American classic and to commemorate the American Numismatic Association's 2017 World's Fair of Money in Denver, Colorado, you can make this famous design part of your collection -- introducing the 2017 1-oz Silver 1877 Half Union Pattern Proof! A HISTORIC DESIGN RETURNS! -- William Barber's neoclassical interpretation of Lady Liberty is brought back to stunning life, wreathed by 13 symbolic stars. Flip the proof over to discover a patriotic eagle cradling a shield with an olive branch and a bundle of arrows in his talons. A PREMIUM PROOF FINISH -- Beginning as hand-selected planchets of 99.9% pure silver, each one troy ounce proof is expertly minted using polished dies and multiple strikes, resulting in a shimmering showcase containing beautiful mirrored fields and sharp, frosted details. 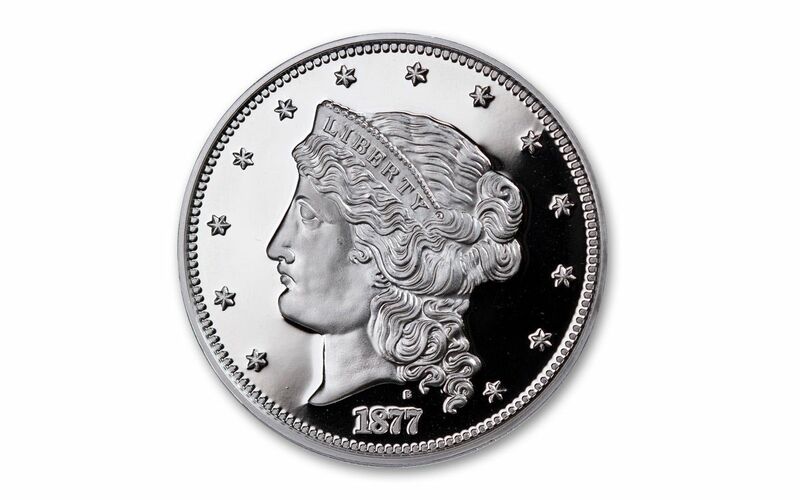 SPECIALLY MINTED FOR THE WORLD'S FAIR OF MONEY -- Joining the eagle on the proof's reverse are the inscriptions "2017 DENVER" and "ANA WFM" -- marks commemorating the American Numismatic Association's 2017 World's Fair of Money in Denver, Colorado. Celebrating the largest annual coin show in the United States, these Half Union Proofs were specially minted for the event! AN OFFICIAL SMITHSONIAN RELEASE -- Officially licensed by the Smithsonian Institution, your proof will arrive to you secured in a plastic vinyl flip along with an individually numbered certificate of authenticity. AN EXTREMELY LIMITED MINTAGE -- As part of the event, only 2,500 of these silver proofs were minted. Once they're gone, they're history! Thanks to our buyers, you don't have to have a plane ticket to Denver to bring home one of the show's hottest collectibles. But don't wait too long -- with added convenience comes less time to act. 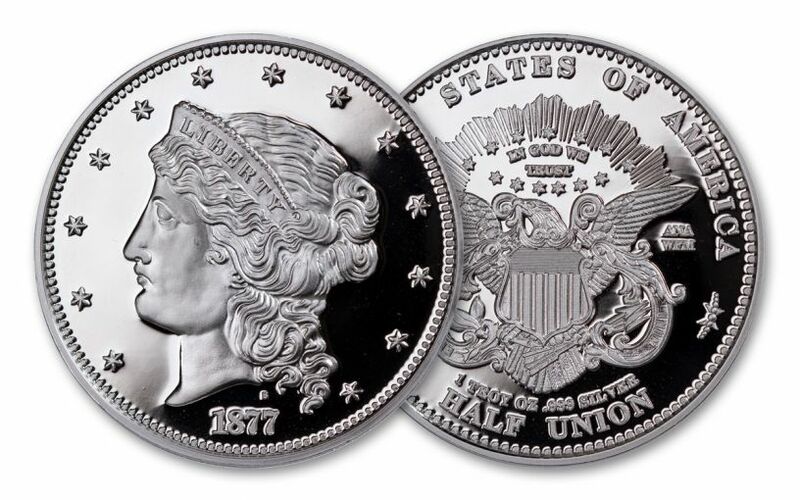 Add one of these spectacular 2017 1-oz Silver 1877 Half Union Pattern Proofs to your cart today!